How do I add and remove the Workspace Switcher launcher from the Unity launcher? How can I remove the Workspace Switcher launcher from the Unity dock? gsettings set com.canonical.Unity.Launcher favorites "['application://nautilus.desktop', 'application://chromium-browser.desktop', 'application://ubuntu-software-center.desktop', 'application://ubuntuone-installer.desktop', 'application://ubuntu-amazon-default.desktop', 'application://UbuntuOneMusiconeubuntucom.desktop', 'application://gnome-control-center.desktop', 'unity://running-apps', 'unity://devices']"
Currently I'm using eight workspaces with the help of Unity Tweak Tool. I like to have multiple workspaces, but didn't like the unremovable Unity Launcher icon that much, even more because it could only resemble four workspaces while I was using eight instead. Drag the undesirable icon on the trash can. Untick the option shown in the following picture to remove the workspace-switcher icon. 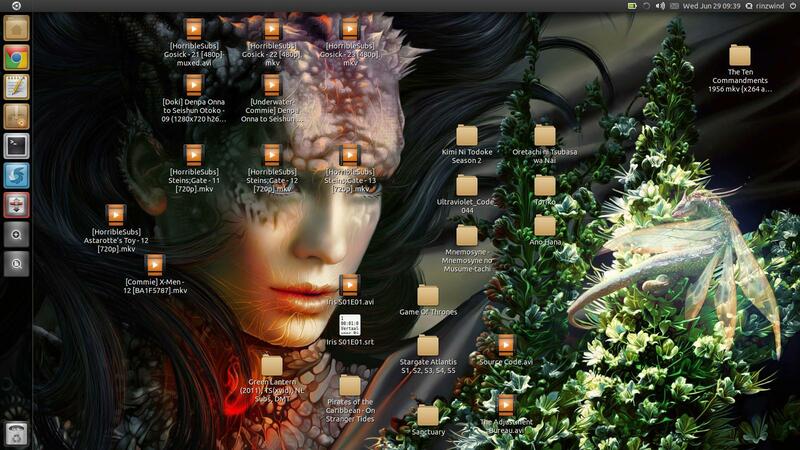 If you are prepared to work with just one virtual desktop (i.e. no additional workspaces) then the following will work for 12.10 and later. Unfortunately the desktop switcher is hard coded to unity and cannot be removed without making source code modifications. Change Horizontal Virtual Size to '1', the Vertical Virtual Size can be any number. Currently there's a handy little bug in unity that allows you to do this. Open a up a terminal and run 'gnome-panel'. Once gnome panel is running, add the 'workspace switcher' applet to the panel. Open up the workspace switcher preferences and select 1 column and 4 rows. Log out and back into unity, and viola! The workspace switcher is missing now. Yes I know, it's a somewhat annoying way of removing it if you use workspaces, but it's the only way i know of right now..
To get the Unity launcher switcher back, simply open the gnome-panel in terminal again, and go back to a 2 X 2 grid. Logout and log back in. This is now easy, thanks to an addition to Isaac Joseph's lovely Unity Revamped (also brings back dodge-windows and dodge-active-window and gives a few other options). Or just use the software updater. Log out and in, and go to ccsm. 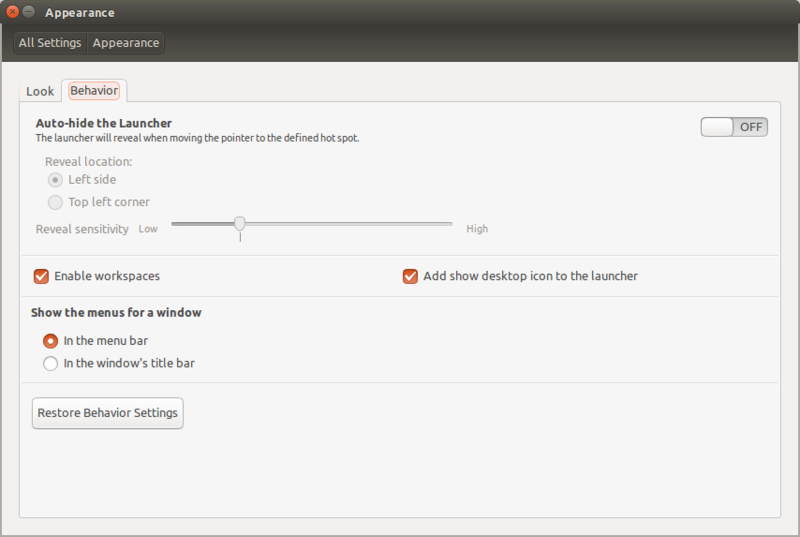 The Ubuntu Unity Plugin will now have, on the "experimental" tab an option labelled 'Show "Expo Icon" in the launcher', that's enabled by default. Disable this and the icon is gone. Disabling the icon doesn't disable the Super+S binding, should that be your preferred way of switching workspaces. Install MyUnity from Software Center. Open it, go to Desktop, decrease (move the bar to the left) for H Desktop and V Desktop, both to minimal. For 14.04 and newer LTS releases with Unity. Launch Settings->Appearance and check the boxes as shown below. Not the answer you're looking for? Browse other questions tagged unity workspaces or ask your own question. 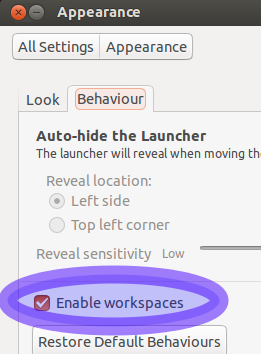 Is there a way to disable the workspace switcher in unity launcher? Why doesn't Workspace Switcher Icon appear in Launcher? How do I remove the workspace switcher from the Unity dock in 12.10? How to remove workspace switcher icon from launcher without disabling workspaces? How can I remove the workspace switcher icon from Unity launcher? Is there a workspace handler in Unity like that of gnome-shell? How can I invoke Scale as a Unity Launcher item? How can I tell what workspace I am in with Unity? How to make workspace switcher work properly?